Welcome to our " BEST OF BEST DREAM 11 " FOR" MID VS SOM" Match dream11 predictions,South Group in English T-20 Blast 2018. 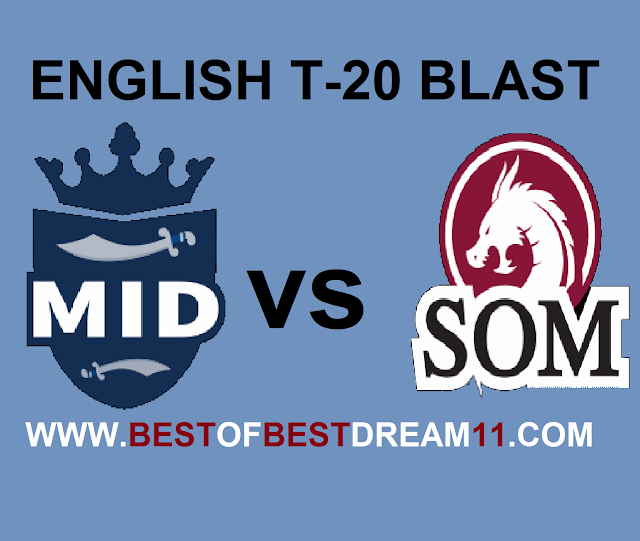 Here is best " MIDDLESEX VS SOMERSET " match,South group in T20 Vitality Blast 2018, dream 11 team for the fantasy user who are looking to make a strong team for maximum win.We are providing latest news ,match update,information about the match.The team is picked by using various factor on the basis of performance .ground stats and latest form. "Middlesex and Somerset have played three matches so far,out of which only one match has won the both the teams.This match will be a great impetus for both teams." 1-After performing a spectacular inning in the first match(66run&4wicket),Paul Stirling did nothing in the last two matches. 2-for MID, skipper Steve Eskenzai ,John Simpson and DJ Bravo will be the key batsman while Tom Helm will be crucial with the ball. 3-Catwright is their leading run scorer with 79 run in 3 game.He is injured in such a way that he will take Riski. 4- For SOM, Corey Anderson is leading scorer with 94 run while J Hilderth and P Trego both had score 82 run in three game. 5- in bowling, L Gregory(4wkt),J Devey and J Overton will be crucial. 1- SOM has announced same squad for this match. 2-MID had done a lot of changes in the squad for MID VS SOM match. 3-E Morgan will now lead the team and Steve finn has been added the team. 3-Gubbin and Malan both will not play,Agar has joined the club. NOTE - Stay connected for more latest team news.